Interested in becoming engaged in the Aquarium's work but can’t make the six month commitment? Or are you a current volunteer looking to get involved in a different part of the Aquarium? Join our mailing list of “one-shot” volunteer opportunities and you’ll be given the opportunity to volunteer on a one-time and/or short-term basis! Volunteers work to clean up local habitat. Many of our “one-shot” volunteers work with us on a regular basis because they have the ability to sign up for events that fit their schedule! 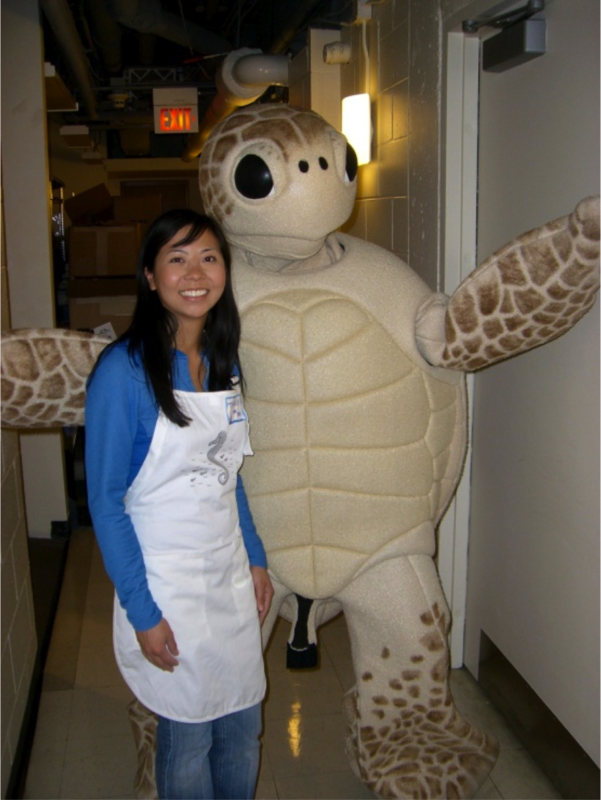 Thanh Truong is all smiles with our turtle mascot. How did you decide to get involved? A friend of mine forwarded me an email that the Aquarium needed one-shot volunteers for a weekend event so I decide to sign up and volunteer. I have continued to do it ever since. What has been your favorite “one-shot” event and why? My favorite event every year is the Halloween party for members—Fish Fun and Fright—because everyone has such a great time. The costumes are amazing! I have helped with everything from face painting to asking the children (and adults) to dance like an octopus for candy. It is a night that everyone looks forward to. What is the best part about volunteering for “one-shot” events at the Aquarium? The best part about volunteering for the "one-shot" events is the flexibility you have on when you volunteer. You choose how much you want to volunteer. In my case, I work a lot during the week but am always up for volunteering after work and on weekends when help is needed. Thank you Thanh, we look forward to seeing you at more events! Want to join Thanh and the rest of our one-shot volunteer crew? Email vols@neaq.org to join the mailing list! Go New England Aquarium Marathon Team!